Hamlet without the Prince would not be a very good play. Janet Yellen’s March 29th speech features a world economy without the Fed. It’s not a very good description of the world economy. The FOMC left the target range for the federal funds rate unchanged in January and March, in large part reflecting the changes in baseline conditions that I noted earlier. In particular, developments abroad imply that meeting our objectives for employment and inflation will likely require a somewhat lower path for the federal funds rate than was anticipated in December. “Developments abroad” since December have been minimal. The major development since December was a very modest pull back in global real GDP growth estimates for 2016 and 2017, from 3.6% to 3.4% and 3.8% to 3.6% respectively. But at least half of the pullback was due to downgrades to US growth estimates, not “abroad”. Given the risks to the outlook, I consider it appropriate for the Committee to proceed cautiously in adjusting policy. This caution is especially warranted because, with the federal funds rate so low, the FOMC’s ability to use conventional monetary policy to respond to economic disturbances is asymmetric. If economic conditions were to strengthen considerably more than currently expected, the FOMC could readily raise its target range for the federal funds rate to stabilize the economy. By contrast, if the expansion was to falter or if inflation was to remain stubbornly low, the FOMC would be able to provide only a modest degree of additional stimulus by cutting the federal funds rate back to near zero. Available policy instruments are now more plentiful for tightening than easing. 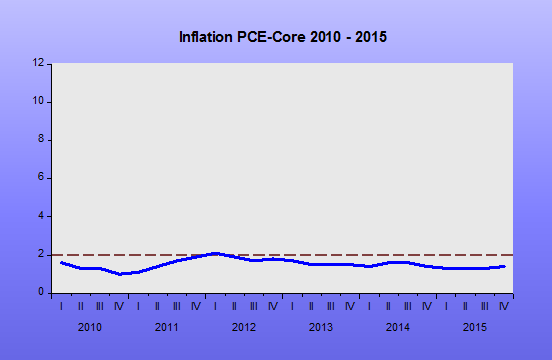 But doesn’t that tell us that the Fed should also be biased towards overshooting on inflation? The risks of undershooting on inflation given the sticky wages problem are far, far more serious than from overshooting on inflation. One must be careful, however, not to overstate the asymmetries affecting monetary policy at the moment. Even if the federal funds rate were to return to near zero, the FOMC would still have considerable scope to provide additional accommodation. In particular, we could use the approaches that we and other central banks successfully employed in the wake of the financial crisis to put additional downward pressure on long-term interest rates and so support the economy–specifically, forward guidance about the future path of the federal funds rate and increases in the size or duration of our holdings of long-term securities. While these tools may entail some risks and costs that do not apply to the federal funds rate, we used them effectively to strengthen the recovery from the Great Recession, and we would do so again if needed. Tools, tools, tools. It should be targets, targets, targets. A 2% inflation ceiling is a prison. Have a more realistic, explicitly flexible target for inflation and you stand much more chance of escaping the prison. And you won’t need all the tools if you dig your escape tunnel in the right direction. If the tunnel just goes from one corner of the jail cell to the other you won’t make it out – no matter what tools you have. Of course, economic conditions may evolve quite differently than anticipated in the baseline outlook, both in the near term and over the longer run. If so, as I emphasized earlier, the FOMC will adjust monetary policy as warranted. As our March decision and the latest revisions to the Summary of Economic Projections demonstrate, the Committee has not embarked on a preset course of tightening. Rather, our actions are data dependent, and the FOMC will adjust policy as needed to achieve its dual objectives. We all know you are not on a pre-set path of rate rises, praise the Lord. Winds will blow, currents flow. Things happen. But what if your economic projections are consistently much more optimistic than the markets, and the markets believe you will tighten according to the command of those projections? The dotplot for future rates will then cause alarm and market reactions. Not the dots themselves but the economic projections, the models that generate those projections. In logic if you start with a falsehood anything can follow. The Philips Curve is false and so the market fears anything can come out of the Fed. Financial market participants appear to recognize the FOMC’s data-dependent approach because incoming data surprises typically induce changes in market expectations about the likely future path of policy, resulting in movements in bond yields that act to buffer the economy from shocks. This mechanism serves as an important “automatic stabilizer” for the economy. As I have already noted, the decline in market expectations since December for the future path of the federal funds rate and accompanying downward pressure on long-term interest rates have helped to offset the contractionary effects of somewhat less favorable financial conditions and slower foreign growth. In addition, the public’s expectation that the Fed will respond to economic disturbances in a predictable manner to reduce or offset their potential harmful effects means that the public is apt to react less adversely to such shocks–a response which serves to stabilize the expectations underpinning hiring and spending decisions. This penultimate paragraph appears to be a nod towards Market Monetarism. The market reaction to bad economic news will save the day as it carries an implicit reaction function by the Fed. This is the “bad news is good news” meme. Sure it happens sometimes, but only when the Fed is on a loosening bias. Things are much more uncertain when unexpected bad news occurs and the market doesn’t know what the bias of the Fed is. And it is really bad when the Fed is on a tightening bias and there is bad news, “bad news is bad news” days are really bad. We saw them in January and February of this year after Fischer’s disastrous “four more hikes” interview. A closer reading of this paragraph makes it seem like the Fed just doesn’t know what it is doing, a consequence of its sticking to false Philips Curve models. It needs to get a better target than hard to measure inflation, and then let the market steer monetary policy properly. There is nothing predictable about this Fed other than it will continue to be unpredictable. Such a stabilizing effect is one consequence of effective communication by the FOMC about its outlook for the economy and how, based on that outlook, policy is expected to evolve to achieve our economic objectives. I continue to strongly believe that monetary policy is most effective when the FOMC is forthcoming in addressing economic and financial developments such as those I have discussed in these remarks, and when we speak clearly about how such developments may affect the outlook and the expected path of policy. I have done my best to do so today, in the time you have kindly granted me. The whole speech is suffused with a view that the Fed is outside of things, not an active player. Until the Fed realises it is the key player we will never get proper monetary policy. The concrete targets set by the fed to fulfil their dual mandate needs reform. The targets they have now don’t work and cause harm and confusion. We need a Hamlet with the Prince, we need a world economy with a self-aware Fed with the right monetary policy, one that is both player and a writer of the play. Although some might be impressed by the Yellen Fed’s reaction function, to Market Monetarists it more appears like a willful child, shooting off in pursuit of a shadow (phantom inflationary projections), before being hauled back to reality by their parents (the market). Perhaps the Fed is reacting better than in 2008, but perhaps not. Perhaps the US economy is weakening much more than they realize, like in 2008, and that merely not tightening is nothing like loose enough. 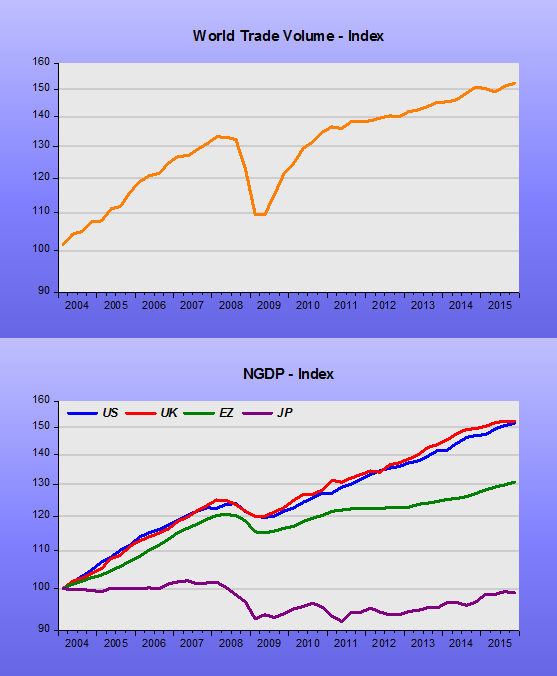 The recent trend in NGDP growth is certainly flashing a warning signal. I think the first point is a fairly fine distinction. There isn’t much difference between a forecast result and a recommended result if the forecast is made by someone in a position to influence that result. The dots seem to me to be a bit of a sideshow, what is really important are the economic forecasts of RGDP, PCE Price Inflation and unemployment. If the FOMC projects that these indicators will all be above target in two years’ time then the market can only draw one conclusion – policy will be tightened. Even on target projections can provide an interpretative challenge. Are the projections only on target because the FOMC has assumed rate rises to pre-emptively prevent an overshooting of targets? What rightly concerns the market is that the FOMC appears to think it has to raise rates despite PCE Price Inflation well below 2% now. And, to a lesser extent, that the FOMC unemployment can now only go up from current levels. The market can only infer that the FOMC thinks PCEPI will rise well above 2% in two years’ time unless it raise rates further, and that employment will not suffer from the rate rises. The FOMC members must be very confident about the economic recovery and the future path of PCEPI and employment. The dots help the market interpret the confidence of the FOMC in its economic forecasts, with both scenarios of no rate rises and one including rate rises. The fact that the economic projections incorporate projections of rate rises means that the market is right to see the dots as a commitment to the trajectory. The problem is the FOMC economic projections contrast with the much more cautious view of the market on the economy. Market implied expectations for PCEPI, through looking at always higher implied CPI, are much lower than the FOMC projections. And here lies the interesting and market-moving clash. Are the FOMC willing to put their money, or rather decisions, where their mouths, or rather projections, are? Will they raise rates and tighten policy thinking that their own inflation projections are so far superior to those of the market? If they do move to raise rates further this will be seen as damaging the economy as evidenced by the markets dropping further. The FOMC says it is data-driven, but is highly selective in the data it chooses. Historic, open to revision and question, data is OK for them to observe, but data that indicates the best guess of hundreds of thousands of investors about the likely future such as market prices is ruled out. The market then worries that the FOMC will only react to the damage that they have caused when the economic data continues to follow current weak trends, or worse. Alternatively, if the FOMC holds off from rises then the market will wonder what it is that they are looking at if not their own economic forecasts. This is the heart of the FOMCs credibility problem. The markets see the FOMC as an unreliable friend, the FOMC sees markets as unreliable, period. The FOMC raises its economic projections above the market´s and then sometimes use them to justify a monetary policy and sometimes lay them to one side. The FOMC may be right to ignore its own projections, Market Monetarists and others certainly think that, but it should then acknowledge that it has done so and that it has become less certain about its economic models. Market Monetarists and the market in general, have seen the Phillips Curve discredited time and time again but the stubborn sticking to it by the consensus at the FOMC and consensus macro means that their credibility is very low, and hence confusion reigns. Confusion about the dots is merely a symptom of this wider confusion. The dots are blameless. Getting rid of the dots as some have suggested or amalgamating them into one projection will not get rid of the faulty models. And the market will anyway continue to speculate on the future path of the target Fed Funds rate. The UK has no dot plot or rate projection, but the market has created an implied one. The BoE even uses it in its models in a bizarre game of cat and mouse, both steering the consensus and decrying it when out of kilter with its own best guess. Even though oil is a less important production input than it was three decades ago, that reasoning should work in reverse when oil prices fall, leading to lower production costs, more hiring, and reduced inflation. But this channel causes a problem when central banks cannot lower interest rates. Because the policy interest rate cannot fall further, the decline in inflation (actual and expected) owing to lower production costs raises the real rate of interest, compressing demand and very possibly stifling any increase in output and employment. Indeed, those aggregates may both actually fall. Something like this may be going on at the present time in some economies. 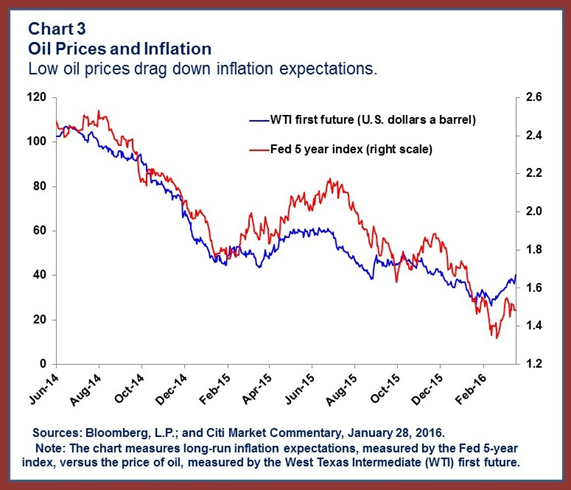 Chart 3 is suggestive of a depressing effect of low expected oil prices on expected inflation: it shows the strong recent direct relationship between U.S. oil futures prices and a market-based measure of long-term inflation expectations. …Our claim is simply that when an oil importer’s macroeconomic conditions warrant a very low central bank interest rate, a fall in oil prices could move the real interest rate in a way that runs counter to the positive income effect. But the “causation” they allude to, from oil prices to expected inflation is just a figment of their collective imagination! If they only looked at a longer time period (beginning in 2003 when the inflation expectation became available), they would have difficulty establishing even a simple correlation. 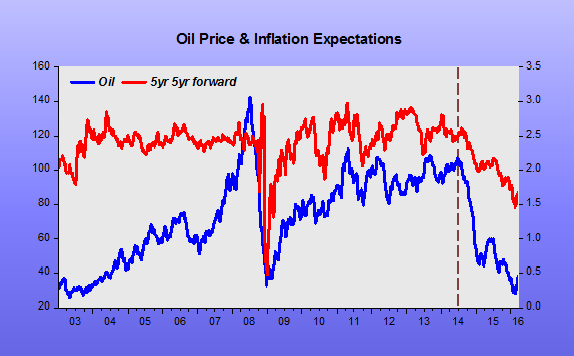 What you do notice in the chart above is that oil prices and inflation expectations fall in tandem when there is a negative demand shock. That´s very clear in 2008/09. More recently, since mid-2014, there the Fed has also tightened monetary policy – a negative demand shock. The tightening was initially expressed through Fed words and has been reflected in NGDP growth slipping, expected one year ahead FF rate rising, the dollar index rising (dollar appreciation) in addition to the oil price fall, among other indications of monetary policy tightening! Not being able to think ‘outside the box’, economists are recycling ‘theories’. In recent days, two have ‘shot up (again) in the charts’: Secular Stagnation and Stagflation. Secular stagnation refers to a prolonged and indefinite period of slow growth and high unemployment (or subnormal factor utilization). When was the last time this happened in the United States? Most people are likely to say the 1930s. In fact, it was the 1970s. These confounding circumstances have led many economists to rally behind the concept of so-called “secular stagnation.” As a diagnosis, secular stagnation is simple: It’s the idea that the economic problems the U.S. continues to face aren’t a product of the “business cycle,” the ebb and flow of boom times and recession (hence the “secular” part), but may well be permanent drags on the modern economy. “It’s a kind of long term and sustained slow-down in economic growth,” says Larry Summers, who served as Bill Clinton’s treasury secretary and is widely credited with dusting off the concept of secular stagnation and bringing it into the mainstream. One interpretation: the market is worried that growth will remain so-so while rising oil prices and incipient wage pressure force the U.S. Federal Reserve to tighten policy. Not exactly the stagflation of the 1970s, which ended in 1980 with inflation hitting 15% amid a recession. 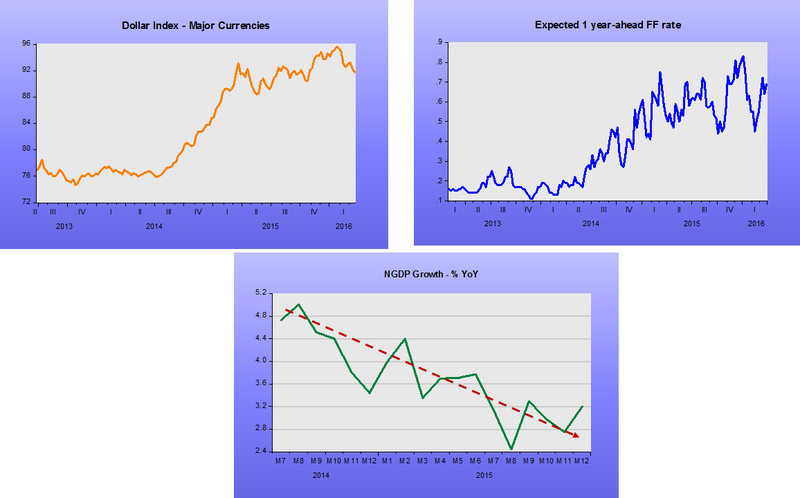 But a sort of stagflation-lite: weak growth and accelerating price rises. “I think we are in a situation where [the Fed] might be forced to normalize rates because of inflation while the underlying economic momentum is slowing down and not capable of digesting higher rates,” said Jean Medecin, a member of the investment committee at Carmignac, a French fund manager. Ignorance is not a reason for embarrassment. When medical doctors do not understand the cause of a disease, they cloak their ignorance with Latin. An illness of unknown origin is ‘idiopathic’. Economists should adopt the same strategy. When growth is slow and we don’t know why, the economy is not experiencing secular stagnation. We are afflicted with a bout of idiopathic tardus augmenti. The facts: At least until 2006 the US has not experienced either “Secular Stagnation” or “Stagflation”! 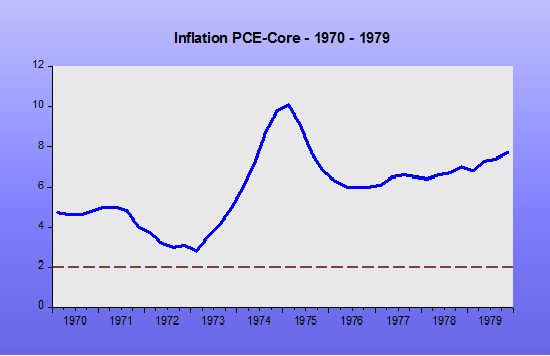 Now, let´s take a closer look at the so-called “Stagflation” decade, the 1970s. 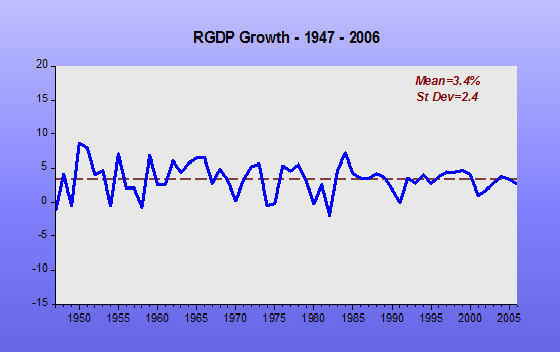 From 1970 to 1979, real growth averaged 3.3%, just a notch below the very long-term trend. 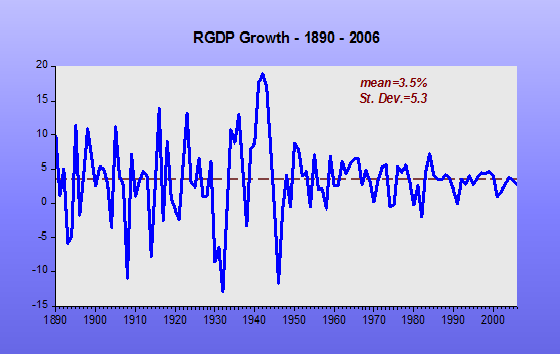 “Choppiness”, at 2.5, was basically the same as that found for the 1947-2006 period (2.4). 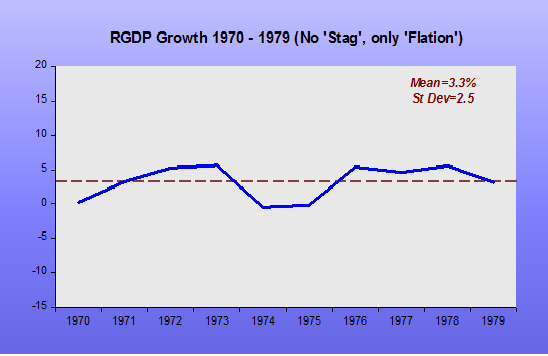 As such, calling the 1970s “Stagflation” is a stretch! But there was certainly a lot of“Flation”! Looking at the post “Great Recession” of 2007-09, from 2010 to the present real growth averaged a much lower 2.1% with almost non existant volatility (standard deviation of 0.5). That may certainly “qualify” as a (still short) period of “stagnation” (maybe not “secular”). It´s better described as a “flat sea at low tide”. 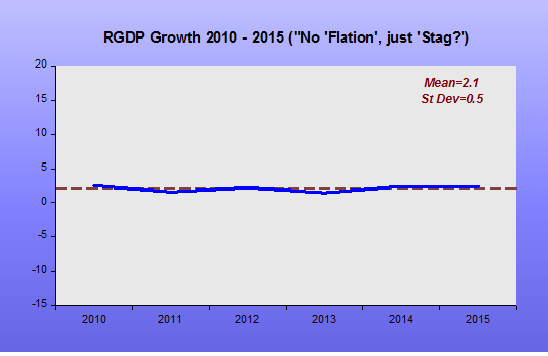 But there´s certainly no “flation” to go along with the “stag”, as the WSJ calls it! A flat sea at low tide is not known to produce “surfer-friendly waves”! 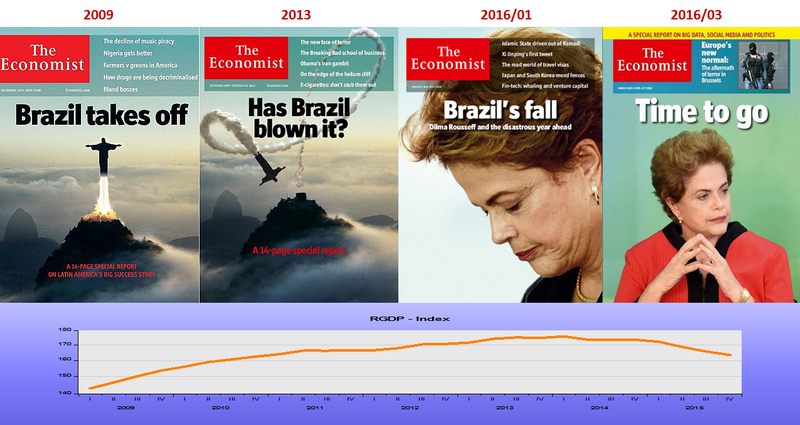 One important implication: If you´re going to talk about “Secular Stagnation”, don´t look to the past for guidance. The reasons must be found in the present! The Fed needs to keep raising short-term interest rates to diminish risks to the economy and markets of “excessive accommodation,” Mr. Kaplan told the Journal on Monday. However, fragile and interconnected financial markets, slow global growth, and the perils of driving the economy back into recession all mean the Fed can’t move aggressively, he said. Yes, dissent has diminished. They´re all of the same view, having embraced the monetary policy framework that Kocherlakota has aptly named “gradual accommodation”. The only divergence is in the definition of “gradual”. To some it means “start in April”. To others it means we can “hang on to what we´ve got” for a while longer! At the Philly Fed the susbstance remains the same, only the words have changed! 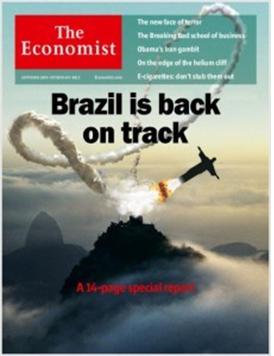 Bur Brazilians are optimists. Shortly after the 2013 Cover came out, many here thought that this (mock cover) could come about! When your argument centers on interest rates and inflation, you´re bound to arrive at a wrong conclusion. The balance of risks suggests the Fed should tolerate rising inflation. A faster pace of increase in wages and prices would be a healthy development for the American economy. Inflation has been below 2% for four years; exceeding that level would affirm the Fed’s claim that 2% is a symmetrical target for inflation, rather than a ceiling. A temporarily higher inflation rate might be an annoyance for some Americans, but it is preferable to imploding portfolios and a risk of recession. Even though Ms Brainard prevailed in March, the debate is sure to continue. The Fed is bound to raise rates again at some point, as inflation rises. Another torrent of mobile capital will then flood in, perhaps swamping the Fed’s attempts to go its own way. The world should brace for more financial storms. There will be no “rising inflation” as long as the central bank constrains nominal spending (NGDP) growth (that´s the “impossibility theorem”). And if there´s no increase in inflation there will be no need, under the Fed´s operating procedure, to raise interest rates. 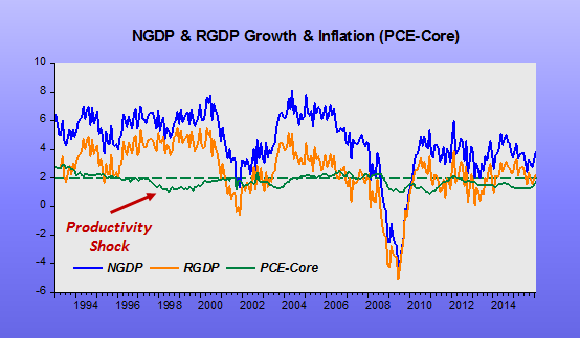 The chart indicates, with monthly data on a year over year basis, that from 1993 to 2006 NGDP growth averaged 5.5%; RGDP growth averaged 3.4% (exactly the same average as from 1947 to 1992) and Core-PCE inflation averaged 1.8% (just shy of the implicit (at the time) 2% target. From 2007 to the present, NGDP growth averaged only 2.9%; RGDP growth averaged 1.3% while Core-PCE inflation averaged 1.6%. In the more recent period average 1.6% inflation is just equal average NGDP growth minus average RGDP growth (for the pre 2007 period while average inflation was 1.8%, NGDP growth minus RGDP growth was 2.1%. 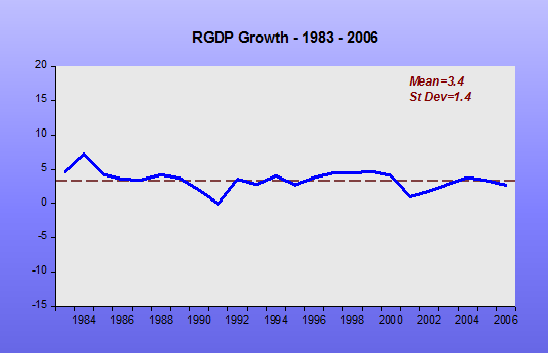 This may reflect the occurrence of a real positive (productivity) shock in the earlier period, which increases RGDP growth and reduces inflation, under a stable NGDP growth regime). Much has been said about a supposed fall in “potential output”. I tend to believe that a significant part of that is due to the “demand downgrade”. Notice that I have not said that the Fed should provide a collective forecast for its short-term interest rate target. Policymakers’ forecasts are inevitably seen as something akin to commitments. The Fed should be committed to delivering particular inflation and employment outcomes, not to a specific path for interest rates. Monetary policy would be much better if only that point was well understood! Bullard said he’s getting “increasingly concerned” about giving forward guidance through projections of how fast interest rates will rise, also referred to as the dot plot. The forecasts probably contributed to the market sell-off at the start of the year, and “I’ve even thought about dropping out unilaterally from the whole exercise,” he said.